Bonesets are fascinating natural wildflowers of the genus Eupatoria. Bonesets are found all over the US, Europe, and Asia in a variety of forms. Scientists are still classifying and reclassifying these plants so depending on which site you look at you might find different names or groupings for these plants. They also have a variety of "local names" which add to the confusion. As hopefully you can see in the photo, the leaves actually look as if they are one long leaf that the stem is poking through the center of. So rather than it looking like there are two separate leaves which happen to come out on either side of the stalk, it looks as if there is one *single* leaf which goes all the way from left to right. This is called a perfoliate leaf and not too many plants have these. 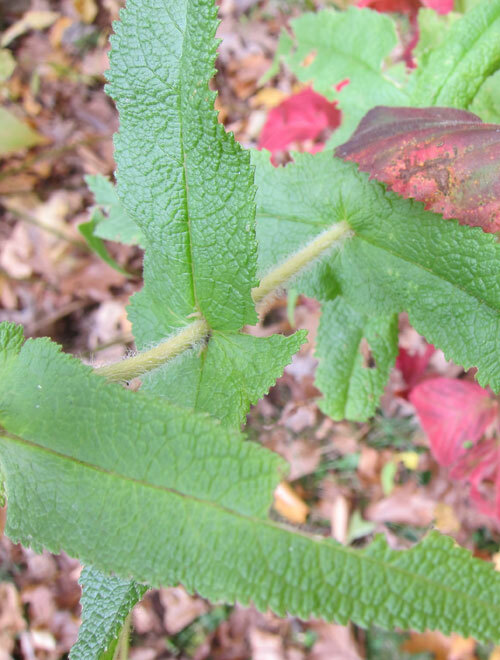 So if your plant has dark green perfoliate leaves which are fairly narrow and pointy, you probably have a boneset on your hands. On to the flowers. I took these photos in October, and by October not much else is blooming in Sutton, besides I suppose the witch hazel trees with their yellow wiggly petals. But the boneset are in bloom. Their fluffy white flowers are almost dandelion like in consistency, with tiny flowerets that can blow away with a strong breeze and scatter their seeds to new locations. They end up looking like patches of wispy cotton, as if a fairy has danced along the path and left glimmers of dust in her wake. 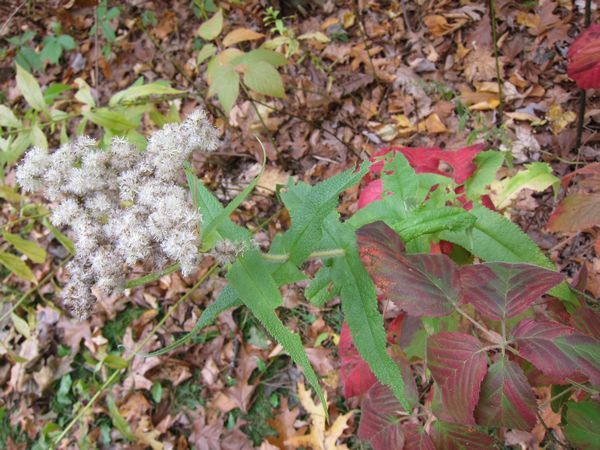 The reddish leaves below are NOT part of the boneset plant. That is a different plant. The boneset is just the tall spike of green. I'll say again that people are mixing and merging this group of plant family together so it's very important to know what you're dealing with. 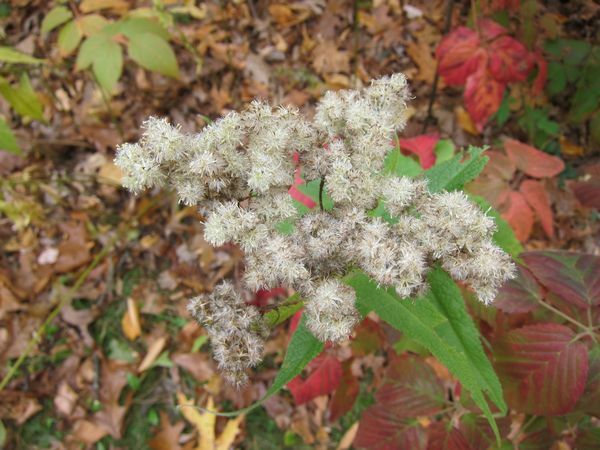 Some herbalists say that boneset (these narrow pointy perfoliate leaved plants) make a good tea for a stomachache. 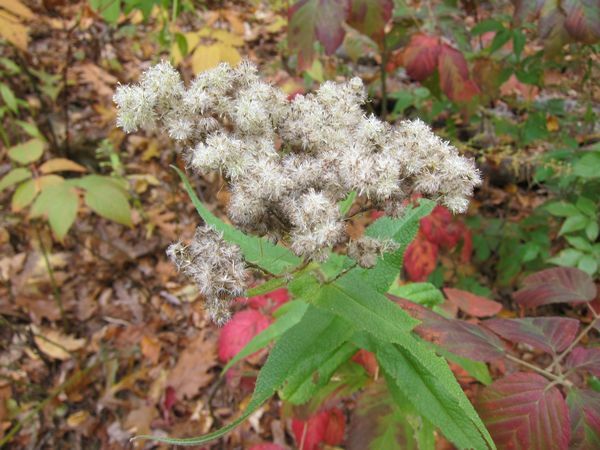 But then some people lump this plant in with the "white snakeroot" which is a DIFFERENT plant. The White Snakeroot has entirely differently shaped leaves. White Snakeroots have individual leaves which are more teardrop in shape. This plant killed off large numbers of colonists and cows because of its poison. Cows would eat the plant, people would drink the milk, and both would end up dying. So with these plants being merged and renamed and so on, I'd be quite cautious if you have any thoughts of eating one or the other. Other than the leaves, the two sets of plants do look fairly similar, with their fluffy cloud of white flowers on the top of a stalk system.